Cheers! 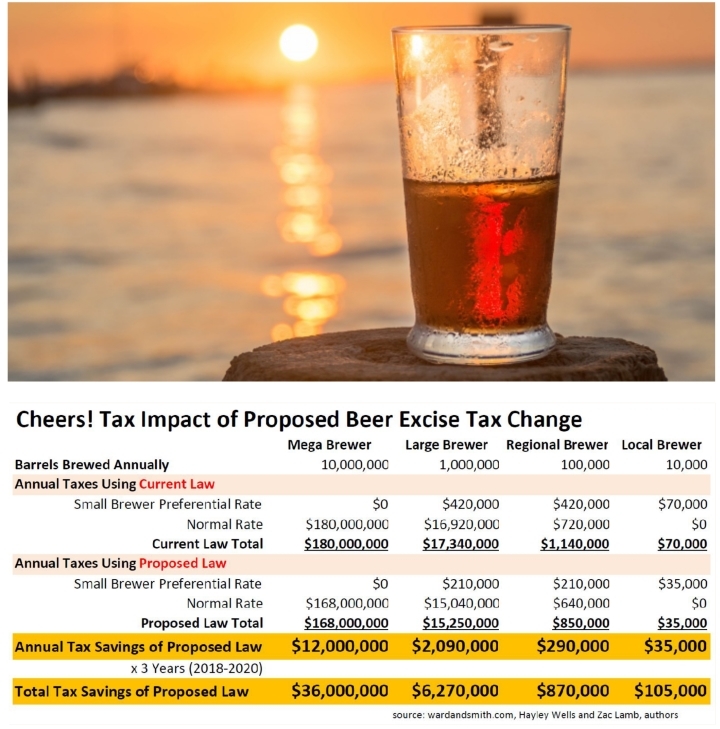 Brewers Will Have Reason to Toast if Proposed Tax Changes Become Law - Ward and Smith, P.A. Much press has been given to recent efforts in Congress to reform the federal tax code. The House and the Senate have each proposed their own bills to amend the tax laws, and congressional leaders are fervently trying to reconcile the two. Amid all of this attention to tax changes, a rarely mentioned provision in the Senate bill currently under consideration grants temporary relief to brewers by reducing the federal excise tax on beer. Beer is heavily taxed. Whether the historical policy rationale for beer's steep taxation remains relevant today can be debated, but there is no debate that beer is currently one of the most heavily taxed industries in the United States. However, brewers might feel some financial relief if the current congressional proposal to lower the federal excise tax on beer becomes law. All beer sold in the United States is subject to federal excise tax which is calculated on a per-barrel basis. Currently, the excise tax is assessed at a rate of $18 per barrel of beer. However, small domestic brewers, those who produce less than 2,000,000 barrels per year, enjoy a lower tax rate of only $7 per barrel for the first 60,000 barrels sold and $18 per barrel for any sales in excess of the 60,000 barrels. Although the excise tax on beer is paid by the brewer, in reality the tax is passed on to the consumer in the form of a higher price for the product. Because a barrel contains 31 gallons, and each gallon is 128 fluid ounces, a barrel holds about 330 twelve ounce bottles or cans of beer. This means the tax on a barrel could be passed on to as many as 330 beer drinkers! The Senate bill, as written on November 28, 2017, would reduce the excise tax on beer in two ways. First, the excise tax for all brewers would be reduced from $18 per barrel to $16 per barrel on the first 6,000,000 barrels sold each year. Every brewer, even the largest ones, would benefit from this reduced tax rate. Second, domestic brewers producing less than 2,000,000 barrels per year would experience a reduction in the excise tax on the first 60,000 of barrels sold from the current rate of $7 per barrel to $3.50 per barrel. These two changes to the tax law would apply only for years 2018 through 2020. In 2021, the tax rates would return to their current levels. Because the tax reduction is only temporary, consumers should not expect to see an immediate corresponding drop in beer prices. The table below illustrates the tax savings various sized brewers would realize if the Senate proposal becomes law. The proffered policy rationale for temporarily reducing the excise tax on beer is to encourage brewers to create jobs and make capital investment. 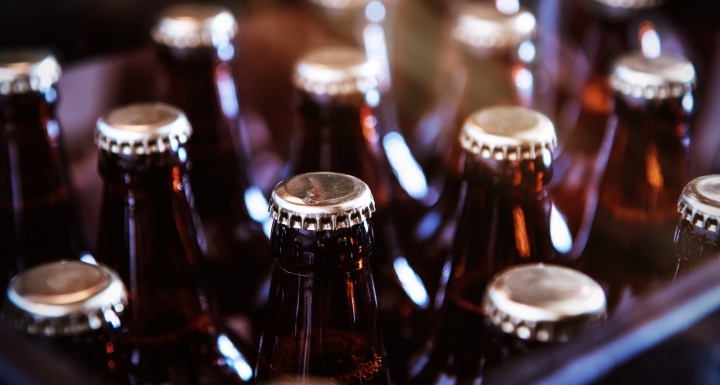 The theory behind this policy is that if the tax burden on brewers is temporarily reduced, brewers could invest the savings into growing their operations and boosting the economy. No new law is ever certain until it has been passed by both houses of Congress and signed by the President. Nonetheless, brewers should keep an eye on the ultimate fate of the Senate proposal and have a plan for how they will deploy the resulting tax savings if the bill ultimately becomes law. © 2019 Ward and Smith, P.A. For further information regarding the issues described above, please contact Zachary F. Lamb or Hayley R. Wells.